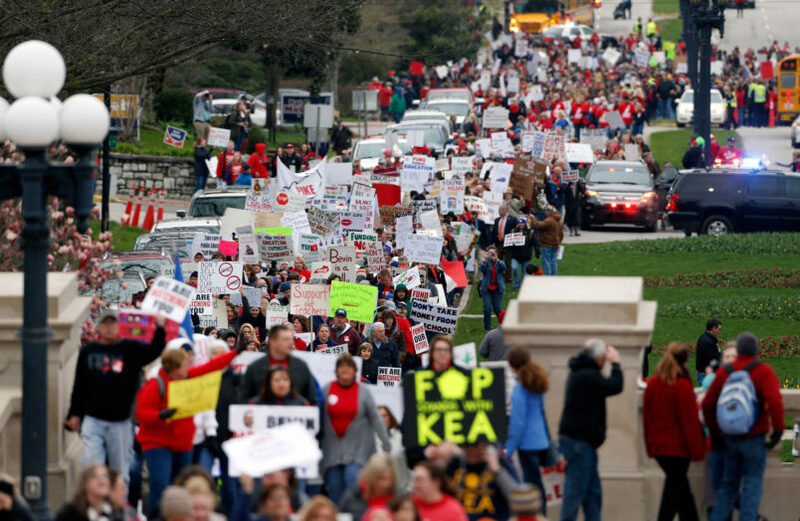 RALEIGH, N.C. (AP) — Thousands of teachers wearing red gathered Wednesday in North Carolina’s capital ahead of a march and rally to demand better pay and more resources for public schools in the conservative, tax-cutting state. With messages such as “Respect Public Education” on their shirts and signs, as many as 15,000 teachers from around the state were expected to participate in the march starting at 10:30 a.m. Police were already posted along the route through downtown to the General Assembly, where predominantly Republican lawmakers were beginning their annual session the same day. Tracy Brumble, a teacher at Milbrook Magnet Elementary School in Raleigh, was with about a dozen fellow teachers at the school waiting for a bus to carry them to the march’s starting point. They were all wearing red t-shirts, matching the color of the #RedForEd theme of the day. “We’re here to tell our legislators and our representatives that we need more funds to keep our buildings in good shape, to get more textbooks, more resources for our students, to just have a better environment for public education,” she said. More than three dozen school districts that together educate more than two-thirds of the state’s 1.5 million public school students have decided to close classrooms to allow for the show of strength by the teachers and their advocacy group. “The fact that a million kids are not going to be in school (Wednesday) because a political organization wants to have folks come there to communicate with us or send a message” should be the day’s focus, said state Senate leader Phil Berger, a Republican. Berger and House Speaker Tim Moore made clear they have no plans to funnel more money to classrooms by postponing January’s planned tax cuts, including one for what is already one of the country’s lowest corporate income taxes. “We have no intention of raising taxes,” Berger said. “We’re grossly underfunding our schools,” he said. Jewell said teachers don’t really expect GOP lawmakers to meet all their demands, which is why they are also urging voters to not re-elect them. “All of this will be fruitless unless we take this energy and passion to the ballot box and change those who are making the policy,” Jewell said.